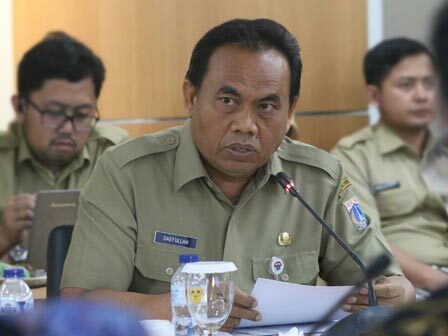 Jakarta DPRD's Banggar along with Jakarta TAPD agreed on the amount of Rp 77.1 trillion in 2018 General Budget Policies and Provisional Budget Ceiling and Priorities (KUA-PPAS).
" Finally total amount of RAPBD next year is set at Rp 77.1 trillion"
"Finally total amount of RAPBD next year is set at Rp 77.1 trillion," expressed City Secretary, Saefullah, at City Council building, Tuesday (11/14). Saefullah delivered, his party would soon input the entire nomenclature of activities after the KUA-PPAS document is signed. "After that, it will be continued with a plenary meeting about delivery of RAPBD by the governor and there is still one more discussion, namely the discussion of 2018 RAPBD," he explained. On that occasion, all meeting participants agreed on the amount of 2018 KUA-PPAS worth Rp 77.1 trillion. Subsequently, the BAP document on ratification of the KUA-PPAS was signed by Jakarta Governor, Anies Baswedan and Chairman of Jakarta Banggar, Prasetio Edi Marsudi. "Alhamdulillah (Thank God), KUA-PPAS has been signed and agreed. The entire DPRD leader is complete and the process runs smoothly," said Anies, after he signed this year's KUA-PPAS.